Legendary investor Jim Rogers couldn’t be blamed for always carrying a piece of gold in his pocket given the uncertainty that stalks global markets. Rogers remains a true believer in the precious metal given his unease with what he sees in global markets. Frankly, he’s worried. He’s not a believer in Wall Street’s rally and is shorting U.S. stocks, though paradoxically for a gold fan he likes the U.S. dollar. And don’t get him started on the U.S. presidential race – he’s not a big fan of either Trump or Clinton. Barron’s Asia recently caught up with the 73-year-old investing veteran in his adopted home of Singapore. Famed for cofounding Quantum Fund with George Soros in 1973, he’s an avid observer of China, a country whose potential inspired the Alabama native to move his family to Singapore so his two daughters could learn Mandarin. While acknowledging the challenges confronting Beijing, he still believes the 21st Century is China’s century. Reflecting the spirit of his book Adventure Capitalist, Rogers also generously offered an eclectic mix of investment ideas from around the world, with picks spanning lithium and graphene stocks, Russian ruble-denominated debt, Chinese tourism plays and a Colombian marijuana company. Barron’s Asia: So what’s your big picture view of global markets? 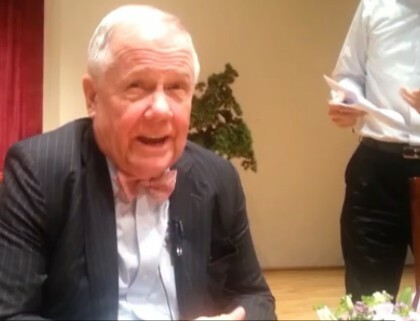 Jim Rogers: People tend to think stock markets are fine because the U.S. averages are okay but the S&P500 is up only because of a few stocks- twice as many stocks on the NYSE are down as those that are up. Amazon ( AMZN ) continues to soar but most things in the world are down. It makes me worried. What seems to be happening now is the U.S. is the only place where you can earn interest or dividends so more and more money is flowing into the U.S. and crowding into a few stocks. I own a lot U.S. dollars and I’m short U.S. stocks. The dollar continues to be strong and it looks like it’s going to go higher and higher. It’s good for me because I own dollars but it’s causing more distortions in the world. People flee into the dollar to earn returns and to seek a safe haven. It has been a safe haven historically but won’t be in the future because it’s going to get overpriced and might even turn into a bubble depending on how chaotic things get in the rest of the world. Also, the U.S. is the largest debtor nation in history. But given few choices at the moment, people buy into dollars. If it turns into a bubble, I hope I’m smart enough to sell my dollars at that point. Q: What could shake confidence in the U.S. dollar? Could a victory by Trump in November sap the greenback’s strength? A: Well, if Donald Trump blows up Mexico or goes to war with China then it would scare people. But even then people are going to think America is going to blow up the world so they would buy more dollars. If Trump wins and he does what he says he’s going to do such as wage trade wars then it’s going to be bad news for all of us. Trade wars have led to bankruptcy and bankruptcy has often led to war. At that point, you’d better own a lot of gold. Q: So you’re no fan of Trump. How do you rate Hillary Clinton? A: With all due respect, Hillary Clinton doesn’t have a clue. The only difference between Clinton and Trump is it’s going to take Clinton longer to force us all into bankruptcy. What happened in the Middle East under Hillary Clinton was a total disaster for America and what will happen under Hillary Clinton as president will be even more of a disaster. Perhaps the only worse disaster for America is Donald Trump. It’s one of the few times in history where both candidates running for the presidency of a major country are disliked by everybody. I’m not going to vote for either of them. Q: How concerned are you about the dislocations in the global economy and the evolution of more sharply divided and populist politics? A: There are a lot of similarities to the late 20s, where there were strange politicians saying strange things and coming to power with strange ideas. At the same time, you have financial dislocations left over from previous financial dislocations. In the late 20s, a lot of money flowed into the U.S. because that’s where you could earn interest. The Federal Reserve raised rates and America drew more money and it led to a huge stock market bubble that collapsed and you may know the rest of the story: we had a depression and we had war. And I see some of the same kinds of personalities and some of the same financial dislocations. In 1927, the U.S. economy peaked but stocks kept going higher while the rest of the world was coming down because of these artificial flows of money. I don’t want to paint too sharp a picture here but the same thing may be happening, and if it is, think about buying a farm in New Zealand or Australia. Q: Gold is up 30% since the beginning of the year. You’ve been a long time bull but are you still buying? A: I own gold but I haven’t been buying. The commitment of traders shows that gold speculators own more gold than they ever have in history. I don’t want to be buying gold because this has always been a contrarian indicator. But if gold goes back down, I hope I’m smart enough to buy a lot more gold. Before this is over, gold is going to go through the roof and could turn into its own bubble – more and more people will lose confidence in governments and currencies and when that happens, they always turn to gold. I’d like for my children to have my gold someday but if a bubble takes shape – everybody owns gold and is regularly buying more – then I’ll have to sell and put my money into something else. Q: What other commodities are you bullish on?